Keith Kawamoto couldn’t believe his eyes. As the Culver City, Calif.-resident was driving near his home last October, he spotted a Nissan Versa with a license plate that nearly had him jumping the curb. It read “442 JAP” — and it was from Kansas. “My gosh! ‘442 J-A-P.’ I said, ‘What is that? !’” said Kawamoto to the Pacific Citizen of his reaction. Before he lost the car in traffic, the quick-thinking Kawamoto pulled out his digital camera and snapped a picture of the car with the slur-sporting license plate. Although traffic was slow, his mind was racing. Was it a vanity plate? A twisted tribute to the 442nd Regimental Combat Team? Or worse yet, an intentional slight against Japanese people or, perhaps, Japanese cars? According to Kawamoto, it would turn out to be none of those. More recently, in 2013, the Canadian province of New Brunswick recalled more than 1,000 plates that contained “JAP” in its six-character combination and that the three-letter combination would be added to a prohibited list. Armed with the digital photo, Kawamoto broached the issue of the “442 JAP” plate at a subsequent meeting of the Venice-WLA JACL chapter. (Kawamoto said he has been a member of the Venice-Culver chapter for about nine years, well before its recent merger with the West Los Angeles chapter.) The consensus was that something had to be done about the plate. Kawamoto decided to take matters into his own hands, eventually firing off a letter to Kansas Gov. Jeff Colyer. In it, Kawamoto informed Colyer about the plate and “told him that this is very offensive and that I don’t think it’s right. It’s very derogatory, it’s a racial slur, it’s very offensive to a lot of people. I said no other state in the union would allow this. “I gave him a brief history in case he didn’t know it,” Kawamoto continued, “of what happened to the Japanese American people on the West Coast during the Second World War, the majority of them being Japanese Americans, with an emphasis on that, if that makes any difference, of them being put in concentration camps and being the most egregious violation of the United States Constitution ever in history. Kawamoto also informed Colyer of WWII’s highly decorated 442nd Regimental Combat Team, whose members were mostly Japanese American. Kawamoto never heard back from Colyer. But he did hear back from Lee Ann Phelps, the vehicle services manager at the Kansas Department of Revenue, Division of Vehicles. Kawamoto was pleased to have heard back from a state official representing Kansas, but the response still left him unsatisfied. 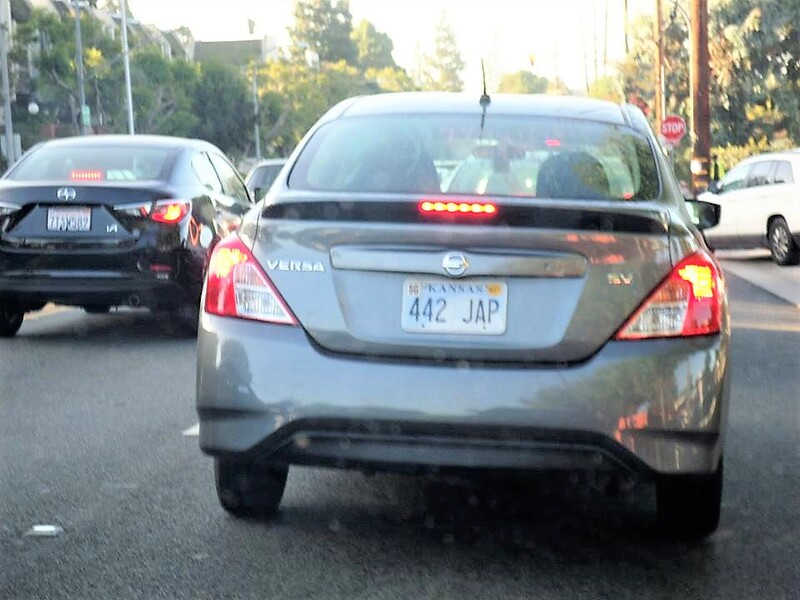 While there was some consolation that the plate was not a vanity plate, Kawamoto found it disconcerting that no one in the system would red flag a plate with “JAP” on it. “To me, that’s even worse than a vanity plate because you don’t have one plate running around, you’ve got maybe thousands of them running around like that,” Kawamoto said. In other words, could there be plates that read “440 JAP,” “441 JAP,” “443 JAP,” etc.? Kawamoto thinks the answer might be yes. For the record, according to JACL National Headquarters, there are a total of four JACL members in the state of Kansas. After being contacted by Kawamoto, the P.C. followed up with an email to Phelps, and referencing Kawamoto’s contact with her, inquired whether Kansas had since added “JAP” to the list of letter combinations to be avoided, regardless of whether it was a random occurrence or a vanity plate. Also asked was whether any extant plates containing “JAP” would be recalled. A reply to the inquiry came from Rachel Whitten, director of public relations for the Kansas Department of Revenue, and she answered that the state has just launched the first major change in more than 100 years in the process for making its license plates. The traditional process, which included embossed lettering, has been replaced with a digital printing process. According to a news release, the new process will be quicker and cheaper — and on demand instead of in bulk. Furthermore, the “printed numbers and letters will then be applied to a flat sheet of aluminum and then stamped out in the shape of a license plate,” to be mailed out to vehicle owners. The new plates will also contain a bar code. For now, “The (442 JAP) plate is currently actively registered in the state of Kansas,” Whitten wrote. Kawamoto, meantime, would like Kansas to drive the extra mile. “I would like the state of Kansas to recall all those plates because you know that would have been done if it was about any other ethnic group, except us, which is the kind of thing that irritates me also,” he said. Kawamoto also waxed philosophical about how it was he who stumbled across the license plate that raised his ire. The Pacific Citizen article misreported the person’s name as Richard Petty. The column also misreported Robin Arnett Petty as Richard Petty and misidentified his wife, Judy A. Petty, as his daughter.